By participating in CMO's State of the CMO 2019 research insights program, you have the opportunity to win a Luxury Escape with Dinner and Breakfast for 2 worth up to $800. Please complete the survey, then in order to be in the running for the prize, please respond to the following question: What’s one thing you think marketing and customer leaders should be doing more of in order to prove their effectiveness to the CEO? 1. The Contest begins on 11 February 2019 at 2:00 a.m. Australian Eastern Standard Time (EST) and ends on 2 April 2019 at Midnight (Contest Period). 2. ELIGIBILITY – VOID WHERE PROHIBITED. This Contest is open to persons who: (a) Are legal residents of Australia; (b) Are at least 18 years old; Persons in any of the following categories are NOT eligible to enter, participate in, or win the Contest: (a) persons who on or after 1 January, 2014 were or are officers, directors or employees of IDG Communications Pty Ltd (ABN. 14 001 592 650) or any of IDG’s respective parent, subsidiary, or affiliated companies, or service agencies, or independent contractors of any of the above organisation; (b) individuals engaged in the development, production or distribution of materials for this Contest and the entities specified in (a) above, the “Promotion Entity”; and (c) persons who are immediate family members (defined as spouse or biological or step- mother, father, sister, brother, daughter, or son and each of their respective spouses) of any person in any of the preceding categories, regardless of where they live, and/or individuals who reside in the same household, whether related or not, as any person in any of the preceding categories. Any questions and/or issues concerning eligibility shall be determined at the sole discretion of IDG. 3. HOW TO ENTER. 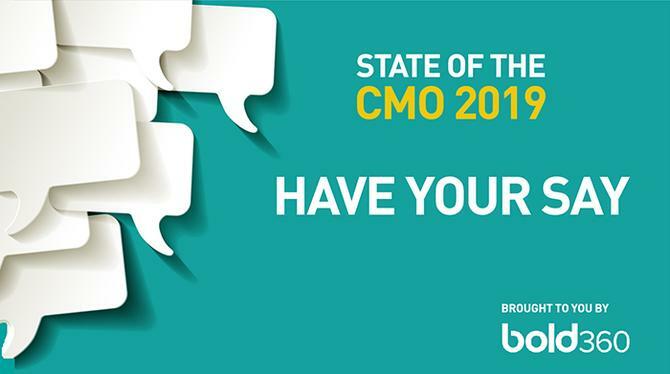 You can enter the Contest by completing the following during the Contest Period: (a) Going to the State of the CMO 2019 research insights survey located at http://www.cmo.com.au/state-of-the-cmo/ (“Contest Website”); (b) Providing a few contact details (name, company, email); (c) Answering a few questions and completing the survey; d) Answer the following question: What’s one thing you think marketing and customer leaders should be doing more of in order to prove their effectiveness to the CEO? Only one entry per person during the Contest Period will be accepted. By submitting an entry you agree to these Official Rules at the time of entry. 4. WINNER SELECTION. At the end of the Contest Period, IDG's independent judging designee will review the Entries and select one winner. The winner will be selected on 15 April 2019 by the CMO editorial team. Winners will be notified by email using the contact information provided at the time of entry. IDG will make two attempts to contact the winner. If IDG is unable to contact a potential winner, the corresponding Entry Submission may be deemed ineligible to win a prize and the next highest ranked Entry Submission may be chosen. In addition, IDG will announce the Winner on the Contest Website and the winning Entry Submission will be featured on the Contest Website. IDG shall have no liability for any winner notification that is lost, intercepted or not received by the potential winner for any reason. In the event of a dispute as to the identity of an entrant, the affected entry will be deemed submitted by the authorised account holder of the email account from which it was sent. A potential winner may be required to provide IDG with proof that the potential winner is the authorised account holder of the email account associated with the submitted entry. If a dispute cannot be resolved to IDG's satisfaction, the affected entry will be deemed ineligible to win a prize but these Official Rules will otherwise continue to govern the affected entry. 5. PRIZES / APPROXIMATE RETAIL VALUE. The winner will receive a Luxury escape for 2 worth up to $800. Prizes are not transferable, exchangeable, or redeemable for cash and must be accepted as awarded, with no substitutions of any kind, except by IDG, who reserves the right to substitute a prize of comparable or greater value, at its sole discretion. Taxes, if any, as well as any other costs and expenses associated with prize acceptance and use not specified herein as being provided are the winner’s sole responsibility. All details and other restrictions of prizes not specified in these Official Rules will be determined by IDG in its sole discretion. 6. GENERAL THIS COMPETITION / CONTEST IS A GAME OF SKILL. CHANCE PLAYS NO PART IN DETERMINING THE WINNERS. AS AN ENTRANT IN THIS CONTEST, YOU AGREE THAT THE PROMOTION ENTITIES (A) SHALL NOT BE RESPONSIBLE OR LIABLE FOR ANY LOSSES, DAMAGES OR INJURIES OF ANY KIND RESULTING FROM YOUR PARTICIPATION IN THE CONTEST OR ANY CONTEST-RELATED ACTIVITY, OR FROM YOUR ACCEPTANCE, RECEIPT, POSSESSION AND/OR USE OR MISUSE OF THE PRIZE(S), AND (B) HAVE NOT MADE ANY WARRANTY, REPRESENTATION OR GUARANTEE EXPRESS OR IMPLIED, IN FACT OR IN LAW, WITH RESPECT TO THE PRIZE(S), INCLUDING, WITHOUT LIMITATION, TO SUCH PRIZE’S QUALITY OR FITNESS FOR A PARTICULAR PURPOSE. IDG assumes no responsibility for any damage to your computer system which is occasioned by accessing the Contest Website or participating in the Contest, or for any computer system, phone line, hardware, software or program malfunctions, or other errors, failures, delayed computer transmissions or network connections that are human or technical in nature. Without limiting the generality of the foregoing, IDG are not responsible for incomplete, illegible, misdirected, misprinted, late, lost, damaged, stolen, or postage-due submissions, Video Entries, Written Entry Submissions or prize notifications; or for lost, interrupted, inaccessible or unavailable networks, servers, satellites, Internet Service Providers, Websites, or other connections; or for miscommunications, failed, jumbled, scrambled, delayed, or misdirected computer, telephone or cable transmissions; or for any technical malfunctions, failures, difficulties or other errors of any kind or nature; or for the incorrect or inaccurate capture of information, or the failure to capture any information. IDG reserve the right in their sole discretion to disqualify any individual who is found to be tampering with the entry process or the operation of the Contest or the Contest Website, to be acting in violation of these Official Rules, or to be acting in an unsportsmanlike or disruptive manner, or with the intent to disrupt or undermine the legitimate operation of the Contest, or to annoy, abuse, threaten or harass any other person, and IDG reserves the right to seek damages and other remedies from any such person to the fullest extent permitted by law. In the event IDG is prevented from awarding prize(s) or continuing with the Contest as contemplated herein by any event beyond its control, including but not limited to fire, flood, natural or man-made epidemic, earthquake, explosion, labor dispute or strike, act of God or public enemy, satellite or equipment failure, riot or civil disturbance, terrorist threat or activity, war (declared or undeclared) or any federal state or local government law, order, or regulation, public health crisis (e.g. SARS), order of any court or jurisdiction, or other cause not reasonably within IDG’s control (each a “Force Majeure” event or occurrence), then subject to any governmental approval which may be required, IDG shall have the right to modify, suspend, or terminate the Contest. If the Contest is terminated for Force Majeure before the designated end date, IDG may (if possible) select the winner(s) from all eligible, non-suspect Entry Submissions received as of the date of the event giving rise to the termination. These Official Rules cannot be modified or amended in any way except in a written document issued in accordance with law by a duly authorized representative of IDG. The invalidity or unenforceability of any provision of these Official Rules shall not affect the validity or enforceability of any other provision. In the event that any provision is determined to be invalid or otherwise unenforceable or illegal, these Official Rules shall otherwise remain in effect and shall be construed in accordance with their terms as if the invalid or illegal provision were not contained herein. This Contest is governed under the laws of the State of NSW, Australia. Except where prohibited, in the event that any dispute arises regarding the meaning or interpretation of these Official Rules and/or this Contest, participants agree that the dispute shall be resolved by applying the laws of the State of NSW, Australia and that it shall be resolved within and by the federal or state courts located in the State of NSW, Australia. 8. WINNER. Check the Contest Website after 15 April 2019.